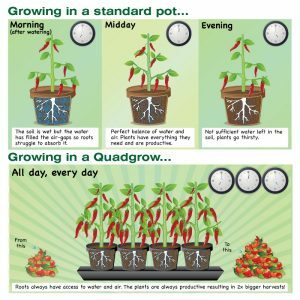 Home › Product Reviews › Quadgrow Tomato Growing System Reviewed – Double Your Crop! This year I’m excited to be trying out a new Quadgrow growing system for my greenhouse tomatoes from those clever people at Greenhouse Sensations. I’m pretty sceptical about claims by products to improve yields but I can see the logic behind the Quadgrow system. 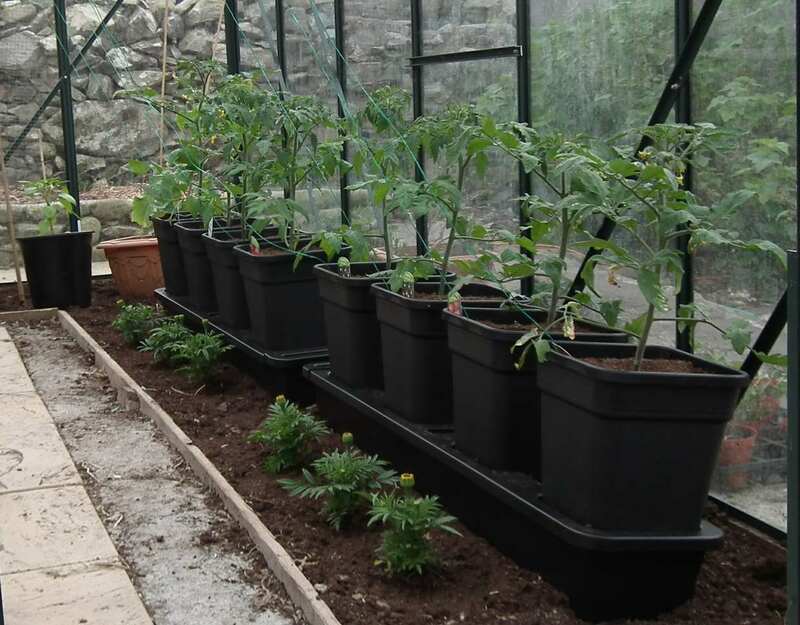 Normally I grow my tomatoes either in large pots of compost or in the greenhouse border and have often used grow bags but they all present some problems when it comes to watering. With pots, particularly when the plant is large and the weather is hot, can be difficult to keep wet enough. Even adding water retaining granules may not be enough unless you’re in a position to water twice a day or set up an automatic watering system. In practice it often ends up with the plants drying out and then being soaked and soaked again to try and re-wet the compost. Planting in the border helps with the watering problem as there is more water in reserve in underlying soil. But it’s not really ideal as watering the border can make the greenhouse too humid, encouraging botrytis and even blight. The other big problem with growing tomatoes in the greenhouse border is the soil (at least the topsoil) needs to be dug out and replaced annually or at least every two years to stop it harbouring diseases and going sour. The Quadgrow elegantly solves the problems of watering tomatoes, especially in a greenhouse. It consists of a base trough that holds a water and nutrient reservoir of 30 litres which should keep the plants happy for 10 days to a fortnight. Above the reservoir sits four 11 litre pots (slightly larger than the size I normally use). To take the water from the trough up into the pots there are wicks that work like a capillary mat, drawing up water as required. It’s a self-regulating system so just enough water is supplied to the plants to keep them consistently supplied and virtually none is wasted. Even evaporation and humidity problems are thought of. The wicks taper at the top so the maximum amount of water is delivered lower down in the pot. The compost at the top appears dry except for being a little damp around the stem of the plant. Replacement wicks are available but I think I’ll get a few years out of this set if I’m careful. The net result is a perfect balance of water and air, maximising growth and avoiding the problems associated with irregular watering. It also saves an awful lot of time as you only need to check the level in the reservoir and add more each week – although you can get away with longer. 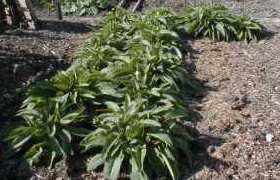 They also supply feed which you add to the water although I suppose you could use your own liquid feed like Tomorite or home-made comfrey tea. If you’re going away on holiday you don’t need to bother a neighbour or rely on the whims of teenagers to water for you! Going away on holiday? You can get a holiday watering kit which gives you an additional 25 litre capacity controlled by a float valve. An optional extra I went for is individual cloches that sit on top of the pots to protect young plants from cold nights. As it turned out we had a cold snap so I held back on planting and kept the seedlings in my Vitopod propagator so they were too big for the cloches when I finally got planting! They did come in useful though for some plants in the polytunnel. Setting up the Quadgrow is simple and easy. It took me longer to read the detailed instructions than to do it! 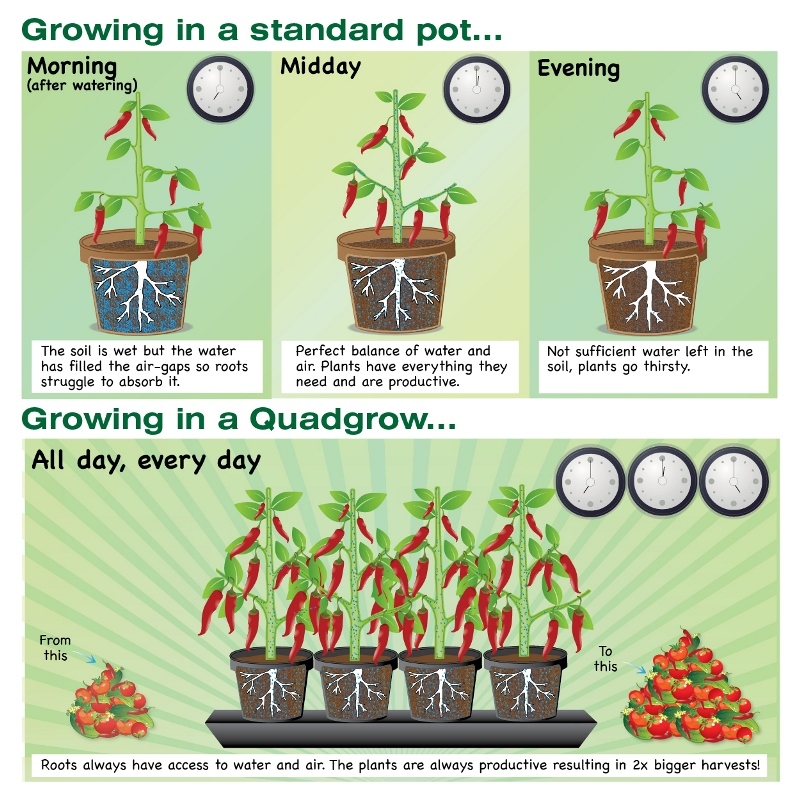 You can also use the Quadgrow to grow other crops such as peppers, aubergines and cucumbers. 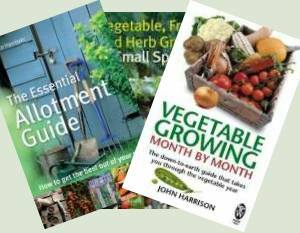 At time of writing there’s an offer giving you a discount of £16 if you buy 2 Quadgrows together and check out this page first for current additional discounts from site sponsor Harrod Horticultural.